1 and 1/8 cup of warm water 110 degrees Fahrenheit or 45 degrees Celsius. 1 diced and deseeded bell pepper. First up you will have to place the ingredients in the pan of a bread machine, in order suggested by the manufacturer and create your pizza base. Next, you will have to preheat the oven to 475 degrees F or 245 degrees C.
Take a large pizza pan and sprinkle it with some cornmeal and roll or pat the pizza dough on it. Lightly flour the surface well so that the dough is not sticky. Make sure that the diameter of the dough is almost the same as the pan, but never bigger. Now you will have to cover the pizza with sauce and sprinkle the garlic, and cover atop with the cheese. Now add the diced chicken on top of it and arrange it along with the bell peppers, tomato and onions. Bake in the preheated oven for 20 to 25 minutes. The cooking time will differ in accordance with the diameter and thickness of the pizza base. Make sure to cook the pizza, till the cheese is melted down and the toppings need to be browned lightly. 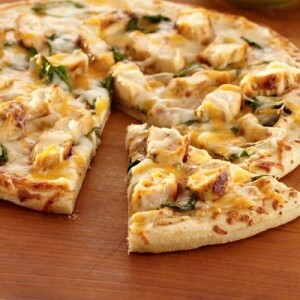 This pizza recipe has chicken in it, but you can alter it with your choice of protein, however, the combination of chicken along with garlic is really good. The recipe is quite simple and you will be able to create a hearty meal for your family. 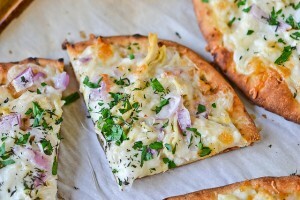 Perfect for those cold winter nights, this pizza will surely make your family really happy. Make sure to use fresh ingredients for added flavor, so that the pizza tastes absolutely delicious. The recipe is very easy to recreate and will be a family favorite for sure.